Falling off the Bone Tender! 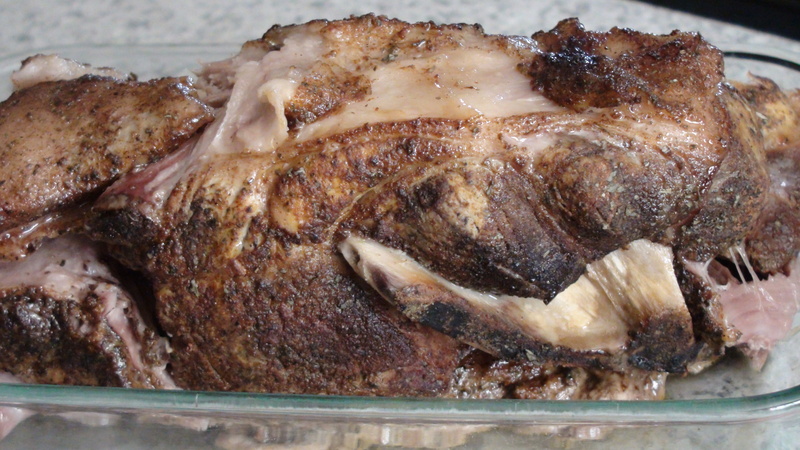 A pork shoulder is an inexpensive cut of pork that is the ideal choice for slow roasting. It is heavily marbled, and boasts a nice layer of fat across one side. It also has a fair degree of connective tissues that result in very tender meat when it is treated right. Pork shoulder is usually one of the cheaper cuts available at the market. This is why it is ideal for mass producing food for your family. One pork shoulder tends to be three to five pounds, most all of it is 100% edible meat! Pork shoulder is available with and without bone. Hot Kitchen recommends a bone-in roast for maximum flavor. Season the meat well with a spice rub, even something as simple as salt and pepper. Roast covered at a temperature 300 degrees or lower. A crockpot is ideal for the home chef. Roast for six – ten hours. When done, remove and let it cool, covered. Use two forks to draw the meat apart. Do another round of seasoning to taste. If possible, smoke the meat. See Pulled Pork recipe for tips about making it work at home.